Office phone service for churches. Whether you are serving a large or small congregation, running the day-to-day tasks for your church is a must. Not only do church leaders need to handle administrative duties, but they also need to coordinate with other church leaders on events and outreach, and have a phone line that’s always up-and-running to meet the needs of their congregation and community. What should churches be looking for in an office phone system? Above all else, church leaders want to ensure that they are available to their community leaders, church members and visitors. Phone features like ring groups and multi-ring options can be customized with your church’s main phone line so that no call goes unnoticed or unanswered. Pastors and other advocates at your church will also not always be in the office – in fact, often these individuals are out serving the needs of the community. Ooma allows you to take office calls on your smartphone as if you were in the office, so you’ll never miss a call directed at your church’s main phone line. Collaborating with other businesses, community leaders and members of your congregation is also a key component of daily church activities. Kooking weddings, baptisms, Sunday services and other events also takes a lot of planning. Greeting incoming calls and routing those calls to the appropriate individual at your church is crucial. That’s why so many organizations like our virtual receptionist feature, as calls can be routed correctly without having to pass through the main office. Mobile access: Many church leaders and pastors are involved in work outside of the church office, such as outreach, charity events and meeting with business and community leaders. With Ooma, you can have office calls forwarded to your mobile phone while still using your church’s main office number, or have calls ring on multiple devices. 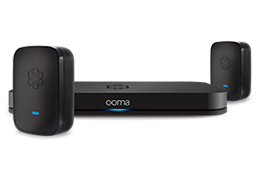 All-inclusive pricing: With Ooma, there are no surprise fees for setup, installation or your office phone line. All Ooma accounts come with a business phone number, toll-free number, virtual fax and a conference extension line. Compared to other office phone systems on the market, Ooma also provides many of the advanced phone features you love at a price you can afford. Virtual receptionist options: Many small businesses say that the virtual receptionist feature is like having another employee in the office. You can customize modes for business hours and afterhours, create custom messages and route callers to the appropriate individual at your church’s organization. There are multiple ways you can customize your features depending on your church’s schedule and size. For instance, we have seen churches set up messages that provide answers to frequently answered questions, address information, service times and updates for events and services affected by snowstorms and other weather-related events.